Texas Fajita Co. was founded by native Texan, Michael Christie, who is passionate about sharing the fun, great taste and the history of authentic Texas-style fajitas. Michael was born and raised in Clear Lake, Texas and managed BBQ and Italian restaurants while working his way through a BBA at the University of Houston. He moved to Los Angeles after college and worked his way through an MBA at USC. After moving to California, Michael was amazed to find restaurants substituting "carne asada tacos" for authentic Fajitas - which are not at all comparable to the fantastic Texas-style steak Fajitas which are the craze and #1 food in Texas. In an effort to share the Texas-style Fajita experience with his friends in graduate school he hosted football tailgate parties to highlight the great fresh taste and festivity of a Texas-style Fajita party. Although Michael became a Chartered Financial Analyst (CFA) and pursued an investment banking career after graduate school, he also continued to pursue his real passion - serving up great fun food with friends! 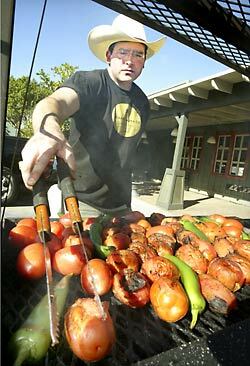 After continued years of tailgating with Texas-style fajitas, Michael's friends and family finally persuaded him to pursue his passion and start Texas Fajita Co. Now Texas Fajita Co. can be enjoyed inside the Los Angeles Coliseum for USC football games as well as at large catering events. In addition Texas Fajita Co. has been invited to be a caterer in the Tournament of Roses in Pasadena, CA.